You are here: Home / Exchange trading / What futures and a futures contract are? What futures and a futures contract are? Futures trading always was a profitable business, even before exchanges emerged. The earliest mention of a futures operation can be found in Politics by Aristotle, written as early as in 335-322 BC. Aristotle narrates a story about a wise man from Miletus named Thales who pulled a clever trick. Based on his own astrological observations Thales made a conclusion that the olive crop would be high and he reserved all oil mills in Miletus and neighboring Chios for the spring at a bargain price. The forecast proved true and the demand on oil mills was high. Thales farmed out the oil mill services on beneficial terms and became rich. a futures and futures trades – what is it? how to increase gains from futures contracts trading with the help of software. SO, WHAT IS A FUTURES? The future is the time to come. and futures is a contract for buying/selling an underlying asset on a certain date in future, however, at the current market price. The underlying assets are stock, bonds, commodities, currency, interest rates, inflation level, weather, etc. (You can find more information about a diversity of futures contracts in the Top Six Unusual Futures article). The exchange platforms, where futures are traded, are called forward markets. The main reason of emergence of the forward trading were problems with delivery of goods. In order to reduce risks connected with roads, weather and storage of goods, forward contracts with settlements and delivery in future were introduced into practice. In 1865, the Chicago Board of Trade developed, for the first time, standard framework agreements on grain trading, which were called futures contracts. The contracts were standardizes by quality, quantity, periods and places of delivery of the commodity, by which a deal is made. At the same time, the system of futures margins was introduced. The traders made cash contributions into the exchange fund. Due to this system, the buyers and sellers were protected from unfair practices of each other. Picture 1 shows a wide spectrum of futures on CME. Screenshot from the ATAS program. a minimum increment value. For example, it is RUB 13.24 for a futures on the RTS index. Complete information on the futures contracts specifications is available on the web site of an exchange, which provides access to the futures trading. For example, these are links to the futures specifications of the Moscow Exchange and CME. A futures contract ticker consists of 4 symbols. Fist two symbols specify the underlying asset (RI is the RTS Index, CC is cocoa, ZC is corn, CL is crude oil, 6E is EUR/USD and so on). Usually these symbols are the same for the same underlying assets on different exchanges. However, there could be differences, since each exchange has the right to set its own code for an underlying asset. For example, BR on the Moscow Exchange means a Brent oil futures contract, while BR on CME means a BRL to USD exchange rate futures. The third symbol is the month of expiration of a futures contract. The following symbols are accepted in the world practice: January – F, February – G, March – H, April – J, May – K, June – M, July – N, August – Q, September – U, October – V, November – X and December – Z. The fourth symbol is the year. For example, the GZU8 futures contract code means a futures on the Gazprom (GZ in the code) stock with the term of delivery in September 2018 (U is September and 8 is 2018). RIZ8 is a futures contract on the RTS index with expiration in December 2018. A futures contract cannot be just canceled or, according to the exchange terminology, liquidated. If a contract is made, it can be closed either by the way of delivery of the underlying asset (deliverable futures) or by the way of making an opposite deal for the same number of contracts (settlement futures). Settlement futures do not envisage physical delivery of a commodity. At the moment of expiration, the exchange closes open contracts and settles the variation margin. These are contracts on oil, gold, weather, interest rates, currency and indices. Deliverable contracts envisage delivery of the underlying asset at the moment of the contract expiration. This could be coffee, grain or stock. At present, only 1-3% of futures trades result in physical delivery, which testifies to a high speculative component of this market. Contract execution, that is, opining of an opposite trade for settlement futures or delivery of the underlying asset for deliverable futures, takes place at the moment of its expiration. The exchange automatically executes (carries out a reverse trade) open settlement futures contracts on the last day of their circulation. 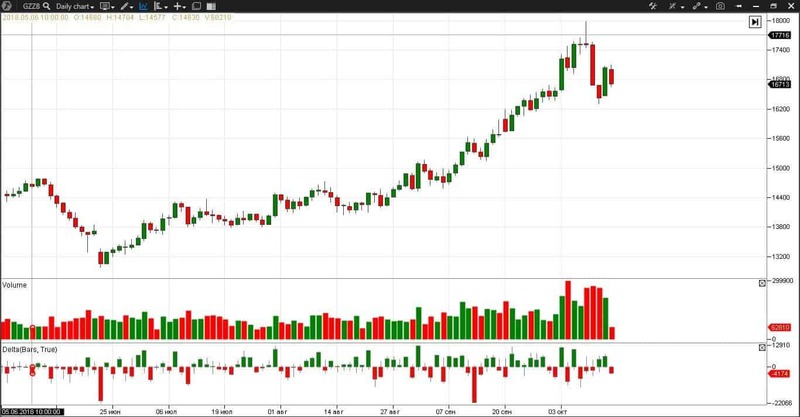 The exchange chart shows data about the course of futures trading registering all futures buying and selling trades. The price, at which the last contract was executed, is considered to be the current futures price. If a contract is still valid, its current price is ever changing. And here we face an interesting nuance. The futures contract price is always a bit different from the underlying asset price, although it has a direct correlation with it. The closer the expiration date, the smaller is the difference between the futures and the underlying asset. 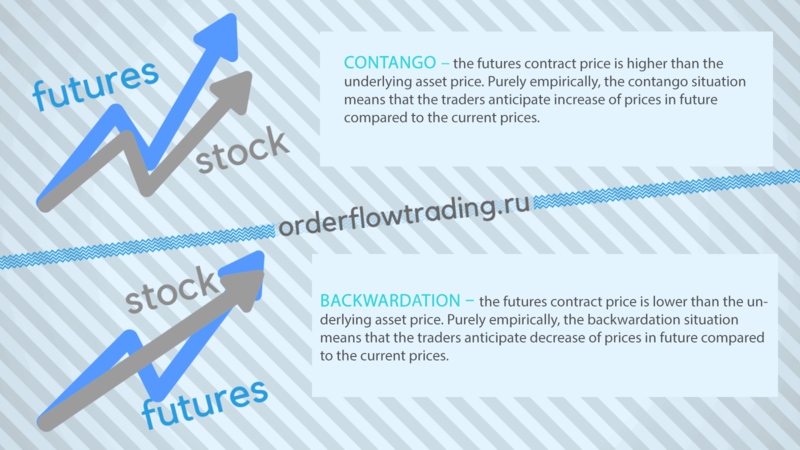 backwardation – the futures contract price is lower than the underlying asset price. It happens when demand significantly exceeds supply and there is no sufficient amount of a commodity or its reserves are scarce. Purely empirically, the backwardation situation means that the traders anticipate decrease of prices in future compared to the current prices. The order of buying-selling a futures contract. When executing a trade, both the buyer and seller of the futures contract deposit a futures margin, which is a financial provision of the contract execution. a variation margin is a sum of profits/losses, which are credited/debited to the trader’s account every day in the end of the trading session. In reality, in the epoch of digital trading, execution of a futures contract can be reduced to one mouse click on the Buy or Sell button. 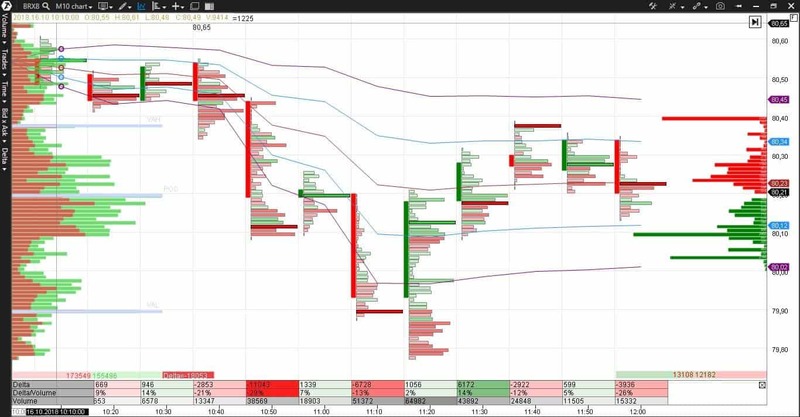 In this article you can watch how to open trades directly from the ATAS chart. WHY SHOULD WE BUY A FUTURES ON AN UNDERLYING ASSET TODAY IF WE CAN BUY THIS ASSET IN FUTURE? Let us consider both cases in more detail. Hedging is the first and original purpose of a futures contract. Let us assume that you produce petrol and you are happy with the current oil price. Naturally, you would prefer to insure your business from possible fluctuations of raw material prices in future. In this case you sell an oil futures and carry on your stable business with cloudless prospects and not caring about news. Another example. Some company, selling a real commodity with its delivery in futures at the price of the current day, simultaneously performs an opposite operation in the futures market, that is, it buys futures contracts on the same quantity of the commodity and for the same period. This company insures itself against losses. The insurance principle in this case is built in such a way that losses in one transaction result in profits in the other and vice versa. How does it look in reality? For example, Oliver Johnson, a farmer from Minnesota, expects to get a wheat yield in three months and he would deliver this wheat to a regular buyer. But there is a risk that the wheat price can go down by that time. That is why he decides to insure himself against such a disappointment through selling a futures contract by USD 3,000 per ton. The wheat price goes up to USD 4,000 per ton in three months time. Then the farmer makes profit of USD 1,000 (4,000-3,000) on selling wheat, but loses USD 1,000 (3,000-4,000) on selling the futures. The wheat price goes down to USD 2,000 per ton in three months time. Then the farmer loses USD 1,000 (2,000-3,000) on selling wheat, but makes profit of USD 1,000 (3,000-2,000) on selling the futures. Speculative trading of futures on an exchange promises high profits. This is why it attracts traders to the forward market. So, why is futures trading commercially profitable? This is a chart of a futures contract price on the Gazprom stock. The period is one day. If we would have bought GZU8 (a futures on the Gazprom stock) at the price of RUB 13,050 per contract on June 22, 2018, then we would have fixed the price of RUB 130.5 (one futures contract of GZ implies delivery of 100 shares) per one Gazprom share. At the moment of expiration (termination of validity) of the contract on September 20, 2018, the futures price was RUB 16,000, that is, the price of one share was RUB 160 (16,000/100). Doing so, the trader either would have received profit of RUB 29.5 (160-130.5) per one share or would have had the right to buy the Gazprom shares at the price of RUB 130.5 instead of RUB 160. A natural question arises: maybe he should have bought the stock on June 22 and not futures? Here the speculative nature of futures, allowing a dramatic increase of profit, comes to surface. 8 ADVANTAGES OF FUTURES CONTRACTS TRADING. Let us calculate the annual gain of the Gazprom stock and futures on the Gazprom stock without including commission fees. Gain in RUB is 158*1,000-135*1,000=RUB 23,000. Gain in RUB is 16,000*10-13,050*10=29,500. Consequently, when trading GZ futures a trader increases the profit from the growth of the GAZP stock in 5-10 times. Low threshold of entering the market. It is not necessary to pay the whole price of the futures in order to buy it. It is sufficient to deposit 8-10% only, a so-called guarantee collateral. In our example above, minimum RUB 135,000 should have been paid for acquisition of 1,000 shares of Gazprom on June 22, 2018, and about RUB 30,000 should have been deposited for acquisition of 10 futures on the Gazprom stock. The exchange commission fee for a futures on the Gazprom stock is about RUB 1 and the brokerage fee is about the same. Commission fees for stock trading are much higher and are calculated depending on the money turnover. Also, you have to pay the depositary for keeping records of your securities. By the way, the commission fees can be adjusted in the trading system ATAS in such a way, so that to control these expenditures in the real time mode. Many brokers offer a credit leverage of up to 1:250 for intraday trading. Thus, having only USD 2,000 on your account you can trade within a day for the amount of up to USD 500,000. High liquidity for popular futures, that is, a possibility to sell and buy it immediately. For example, a standard daily turnover of the USD/RUB exchange rate futures exceeds RUB 100 billion. A vast number of instruments. More than 90 futures are traded on CME and 50 of them are on the world currencies. The Chicago Mercantile Exchange (CME) is the main world platform for trading futures. The main platform for trading futures in Russia is the Moscow Exchange (MOEX). It offers more than 40 types of futures. On the Moscow Exchange, you can trade futures from 10:00 until 23:50, that is, both in the European and American sessions. “A game” with a zero sum. A number of sellers is always equal to a number of buyers in the futures market. Futures contracts do not appear from nowhere. To buy a futures contract one trader needs another trader who will sell it. 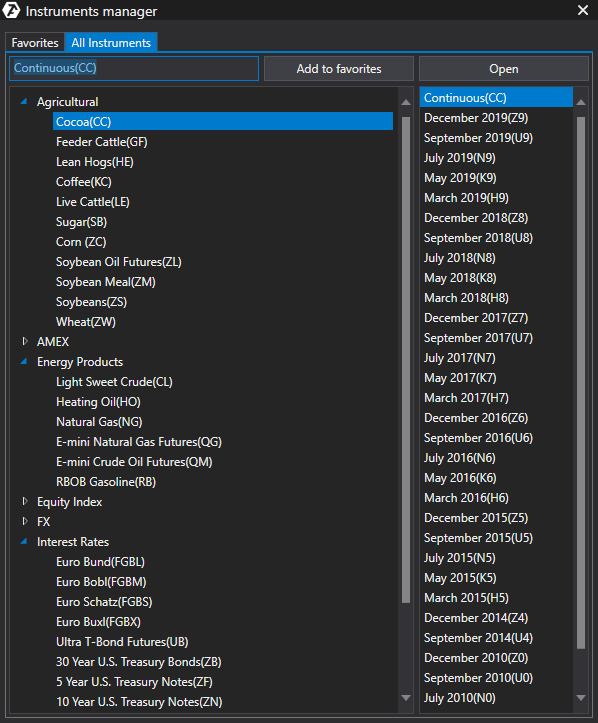 That is why the open interest indicator, which shows a number of active contracts, is available for futures. Analysis of this indicator (it is a topic for an individual article) allows increasing the probability of correct entering into the market. It is natural that trading in financial markets is connected with high risk. And the futures trading is not an exception. However, futures provide a unique speculation method for those who want to make less risky profits. This method is the futures spread trading. The futures spread trading is simultaneous buying and selling various futures contracts on one and the same commodity or on a commodity that is connected with it. For example, here we will see how to trade a spread between common stock and preferred stock of Sberbank. A spread is calculated as a relation of the price of a futures on the Sberbank common stock to a futures on the Sberbank preferred stock. As we can see from the picture, the spread varies within 1.26-1.09. 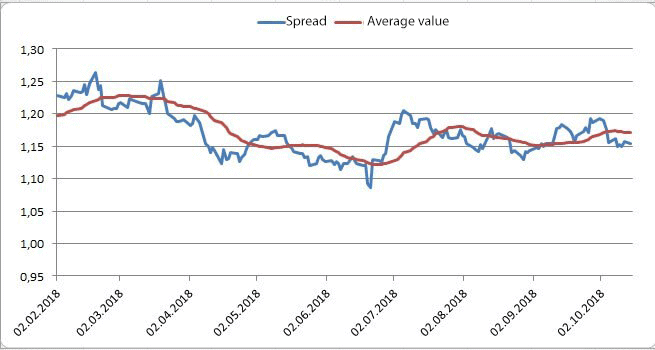 The logic of trading this spread lies in buying a futures on the Sberbank common stock and selling a futures on the Sberbank preferred stock at minimum spread values and in an opposite operation at maximum spread values. How to increase profit trading futures. In order to increase trading efficiency, apply cluster analysis for better understanding of the current nature of the futures market. The cluster analysis is the most modern type of analysis, which allows comprehensive assessment of the price and volume interaction. The trading and analytical ATAS platform provides all possible instruments for the cluster analysis, including some unique developments. The cluster display can be presented in a number of forms in the trading and analytical ATAS platform: by bids and asks, by delta, by volume, by trades and by time. various chart types, such as Range, Reversal, Reno and others. Picture presents a cluster chart (or a footprint) of the BRX8 oil futures. 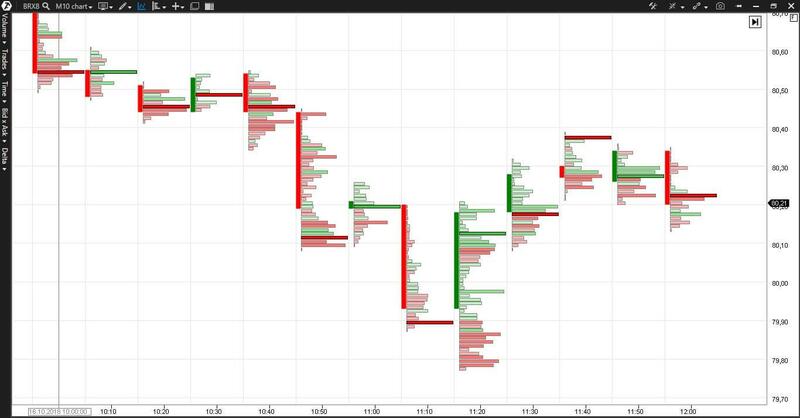 As you can see, this method of the trading course display clearly visualizes the market behavior at the intraday low. Note the ten-minute period from 11:20. The red color of clusters at the low displays selling at crossing the psychological level of USD 80 a barrel. However, the selling was consumed by the buyers, since the delta became positive. Such a pattern of behavior of buying and selling is usually read on a false breakout. Consequently, a trader, who is monitoring the buying and selling clusters, receives an idea from the chart for the counter-trend buying on the false breakout of the psychological level of 80. By the way, this level coincides with the Value Area Low (VAL), which adds confidence to the signal of the short-term long against the trend. The false breakout of the psychological level can be read very clearly in the cluster chart on small periods (minutes and ticks). Try to do it with ATAS. And watch how the damping panic on false breakouts changes to buying and the upward movement of the price. Study patterns of buying and selling on extreme points of the futures market of interest and you will surely get ideas for building your own strategy. Futures is a relatively simple but very advanced financial instrument for making a speculative income. On the other hand, futures are high-risk instruments, that is why, if you plan to trade them you should use the most advanced and modern software. 9 popular strategies of option trading on CME Gold price analysis with the help of indicators for volume analysis.